The 2014 Motorola Moto G and Moto X 2nd Generation phones have both been updated to offer faster performance compared to the previous years’ models, and each have their unique benefits. This article will briefly explore the advantages of each phone. Android 5 Lollipop. When you read the 14 page summary of new features offered in Android 5, you may agree that Android has surpassed all other smartphone operating systems. It’s not just a slightly modified version of Android 4.4.4, but a total redesign (familiar, yet so much better). This makes any phone with Android 5 an amazing phone. The Moto G (Global GSM Version) is one of the first phones on the planet to offer Android 5. Although the Nexus 6 is advertised as the only product to offer Android 5, the Nexus 6 remains sold out and unavailable to the average consumer. It’s important to note that it’s only the Global GSM Version of the Moto G that receives the free OTA (over the air / pushed out) automatic Android upgrade from 4.4.4 (KitKat). The US Model doesn’t offer this upgrade yet. If having access to Android 5 is a priority for you, then the Moto G Global Version is the only phone for you. There are unapproved ways of reprogramming other phones to load modified operating systems including Android 5, but these void the warranty. By the time you read this article, other phones may be receiving updates to Android 5, but you’ll need to check to verify this, and the updates sometimes get rolled out over a period of days or weeks so it’s not guaranteed. Where Android 5 is adopted by other manufacturers, it probably won’t be the pure (stock) Android version, but a heavily modified and tweaked version to make it compatible with the modifications and special apps from that manufacturer and the carrier. Moto G offers one of the purest cleanest Android 5 experience available. Audio. The Moto G has two front facing stereo speakers that produce surprisingly good sound. Many other more expensive phones have only mono sound with a tiny speaker on the back of the phone where you might cover it with the palm of your hand, or have the sound muffled when the phone is sitting on a noise dampening surface such as a couch, bed, or blanket. Case. The Moto G is durable enough that you may not feel a case is needed for protection. At only $180 for the phone, the cost of a case is significant — given that the price of some phone cases could be as much as 20% to 30% of the entire cost of the phone. Not having to buy a case saves considerable money and helps retain the thin light design of the phone. Display. The Moto G has a very bright and colorful 5″ display that’s easy to read. When playing high quality 4K YouTube videos for example, it almost looks 3D. Even though the resolution is 720p (1280×720), it looks stunning and amazing.The AMOLED technology of the display makes it very pleasant to look at. The surface of the screen is made of Corning® Gorilla® Glass 3 which is virtually indestructible. This is much preferred to other phones which seem to use ‘chimpanzee glass’ that shatters into a million pieces with the slightest provocation. Feel. The Moto G has a very nice feel to it. The back of the phone is a smooth but not slippery surface that is very comfortable and soothing to the touch. The fit and finish where the back removable case meets the phone is almost seamless, so there are no rough or sharp edges. Handling. The Moto G is thin and light, making it easy to handle and slip into your pocket. Size. The Moto G isn’t much bigger than its 5″ display — which makes it easy to handle and operate with one hand. It’s tempting to have a larger phone that can double as a small tablet device. However, for all the times that one handed operation is needed, it’s preferable to have a smaller phone and buy a separate tablet device with the screen you really desire. Displays smaller than 5″ become less usable either because of having a limited viewing area and/or because of smaller fonts being hard to read. Storage. Although the phone comes with only 8GB RAM, it can be easily expanded with an internal microSD memory card. Drawbacks. There are a few drawbacks to the Moto G.
Camera. The camera quality in the Moto G is adequate, but not exceptional, and some people have reported difficulty getting the camera to focus precisely on what they want to be taking a photo of. If you swap out your camera app with the Google Camera rather than the build-in camera software, you may get better results. Keep in mind that these are not for award winning professional competition photos that can be enlarged. These cameras are primarily for quick snapshots of average quality. Battery. The battery isn’t removable. For people who travel a lot, it’s nice to have a few extra fully charged batteries with you to swap out when the battery gets low. Or, if a battery becomes defective, removable batteries ensure that you only need to replace a battery instead of the entire phone. Speed. Having a slightly slower processor than the more expensive phones, the Moto G may be sluggish when playing some games or when viewing very high resolution videos — depending on what else is running. Storage. Despite having a removable microSD storage card for added expansion, the Moto G is still limited to the included 8GB storage for most system operations. Application and media can be stored on the microSD, but other system functions can’t be moved, so you may at some point reach the upper limit of the device’s storage capacity. In 2014, Motorola announced the Moto X 2nd Generation phone. It’s an excellent choice for people who like the benefits of the Moto G, but want a more powerful processor and faster 4G LTE mobile data speeds. Based on the Moto G specs shown above, here are some points for those who are considering the phone. Android. The Moto X comes with Android 4.4.4 KitKat. Although it’s been announced that Android 5 is available for the Moto X, the update hasn’t been fully released yet. Availability will depend on when your carrier approves and releases the update. See more details above for the Android entry under Moto G.
Audio. The sound of the Moto X is quite good. However, it lacks the front facing speakers of the Moto G. Even so, audio quality while talking on the phone (top speaker) or listening to music and video is quite clear and loud. Case. Any phone costing several hundred dollars or more should probably have a case, or bumper guard (rubber protection for edges). Fancier phones tend to have metal edges and fancier finishes that one would want to protect. 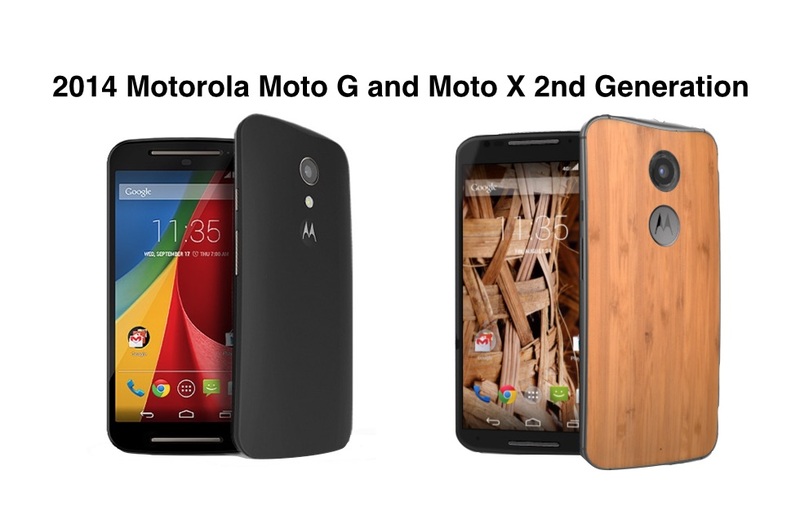 So, with the Moto X, various cases are available. As with any phone, the use of a case will change the phone size and feel. Custom Design. For anyone wanting a phone made partially of bamboo or wood, a customized Moto X is your only choice. Other phones on the market are made of metal and plastic. Having the natural feel of wood in your hand is very nice. Also, knowing that your phone is made partly from renewable, organic, compostable materials is kind of cool. The Motorola Moto Maker let’s you completely customize the colors and materials of your phone. Feel. The Moto X has a nice feel to it, and depending on the material you choose for the back of the phone case, it can be customized to have a touch you’d like most including choices of bamboo, wood, leather, and more. Handling. The Moto X is heavier than the Moto G, but otherwise feels good in the hand and easily slips into a pocket. Size. The Moto X is almost identical to the Moto G in size and appearance. So, it has the optimal size for single handed operation. Storage. The Moto X lacks the removable microSD option found on the Moto G, but it is possible to order it with storage capacity of 16 GB or 32 GB ($50 more). Any additional storage would need to be connected via the USB port. Drawbacks. There are a few drawbacks to the Moto X. Camera. The camera quality in the Moto X is adequate, but not exceptional, and some people have reported difficulty getting the camera to focus precisely on what they want to be taking a photo of. If you swap out your camera app with the Google Camera rather than the build-in camera software, you may get better results. Keep in mind that these are not for award winning professional competition photos that can be enlarged. These cameras are primarily for quick snapshots of average quality. MicroSD. Most smartphones have a removable MicroSD. The Moto X does not. This means you’re limited to the internal memory, unless you connect an external USB storage device. 4G LTE. The latest cellular data service is 4G LTE and it is capable of delivering Internet speeds that are likely faster than what you have at home. In cities where the market is saturated with 4G LTE devices, there can be connectivity issues and slowness. This also happens at football games and other situations when the 4G LTE network is overloaded. When traveling, it’s likely that there won’t be 4G LTE service, so your phone will adjust to use slower networks, or no data at all for areas where only phone service is available. The Moto G doesn’t have 4G LTE capability. It has H+ capability which can deliver about 21 Mbps. Click here to learn more about various speeds and services. Audio. Many people use headphones with their smart phones. So, the audio quality when playing videos and music on a smart phone is really only important for those who don’t plan to use headphones. Battery. Most smart phones state that they can provide 8 hours or more of continuous use. However, getting to the end of the day typically requires a recharge, especially if you are using features like video viewing, GPS mapping, and hotspot wireless sharing. You could try to carry around an extra battery if your phone accommodates that. Otherwise, you may want to consider a charging pack (a small portable charging station). Also look for phones that have turbo (fast) charging features. Camera Quality. Most mobile phones can take fairly good photos. At least, they look okay on the phone display. If photos get enlarged, or if you zoom in on a desktop computer, the quality diminishes. This is true even for the 41 megapixel phones. While the images look nice on screen, when uploaded to social media like Facebook or Pinterest, the quality can sometimes be degraded if images get compressed. So, ultimately, smartphones have a very difficult time competing with point and shoot cameras of almost the same size.The quality of point and shoot cameras has increased dramatically, size has decreased, and prices have come down. Any serious photographer will want to consider carrying a small point and shoot camera in addition to their phone. There are other more important considerations besides camera quality to have as a priority when choosing a phone. Display Quality. In the same way mobile phones have been competing with higher megapixel cameras, displays are also increasing in their resolution and pixels per inch. With high-end DSLR cameras, we know that just adding more megapixels doesn’t necessarily result in higher quality photos. So, with displays the same is true. A lower resolution display might actually be brighter, more colorful, and easier to look at than a higher resolution display. The Moto G is an excellent example of this. Walk into an AT&T store, and compare all the phones, including those costing $800 or more. You’ll likely decide that the Moto G has the best display quality. Processor Power. The processing power of smart phones, like computer, is dependent upon the computing CPU and available cache memory (a small amount of very fast memory close to the processor). The Moto G and Moto X are fast enough for most tasks. If you plan to do intensive gaming or other tasks, you may want to consider an even faster phone. Storage. With data increasingly being stored in the cloud, it’s less important to have huge amounts of storage in your mobile device. In fact, if you do accumulate 32 GB or more of data stored up in your phone, it will take a long time to copy it off. Most phones have microSD expansion storage. Or, even if microSD storage isn’t available, you can get an OTG (on the go) cable and connect a USB flash drive or hard drive. Given these considerations, the actual built-in storage is less relevant. Given it’s low cost ($180), a person might consider purchasing a Moto G as an accessory for their existing phone. If you use hotspot (tethering) with your primary phone, you can have the Moto G connected to the Internet wherever you go. If your primary phone is an iOS (Apple) device, then it will give you the ability to use Android apps as well. It will give you an additional screen — like having side-by-side dual displays with a desktop computer. It will also give you a device to use for Internet access and other uses, thereby distributing your battery usage across two devices — extending your usable time.